"Richard and his team's creative works are incredible. First, they listen to their client very carefully to identify obstacles and opportunities. Richard is a man of integrity, and we are so satisfied with his creative ideas. Since my main business is in Japan, I wish I could take Richard and his team to Japan. Richard and his team share the same philosophy in that they always think and create win-win situations where they become happy because their clients are happy and satisfied in working with Artistry Labs." Building on a long-term relationship, which has included corporate branding for Miyama USA, its previously held Shelton high-rise, and its unique and innovative corporate warehouse space, SOHCO, Miyama turned once again to Artistry Labs after purchasing an ideally located piece of corporate real estate. We set out to make the most of the property's unique location. The surrounding community had yet to realize that a massive city park was being built right on their doorstep. 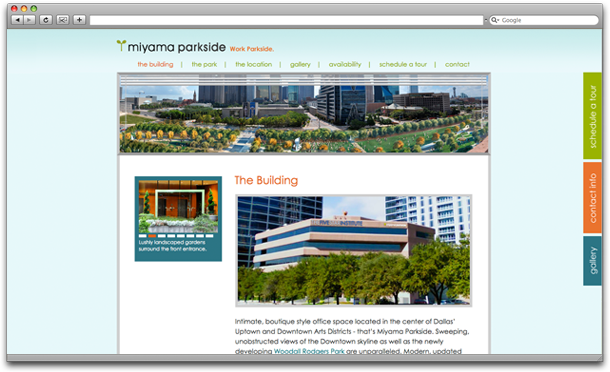 Artistry came alongside Miyama to create an eye-catching website that would convey the fun, boutique atmosphere of the property and showcase the multitude of park amenities available to future tenants. Vibrant colors and sweeping photos highlight the property, Miyama Parkside, which is located adjacent to the future Woodall Rodgers Park and Dallas' booming Arts District. 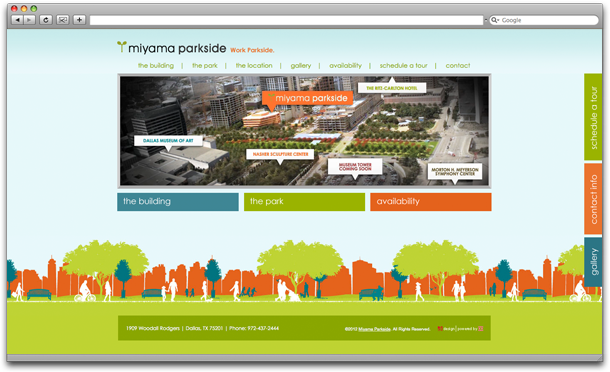 Content created specifically for the website paints an all encompassing picture of what one can expect from life at Miyama Parkside. Future tenants will have spectacular views, full access to park activities and amenities and be within walking distance to any of the organizations that call the Dallas Arts District home, including the AT&T Performing Arts Center, Meyerson Symphony Center, Dallas Museum of Art and Nasher Sculpture Center. Miyama USA is not only pleased with how the site turned out but also with how it's directly contributed to recent sales. Shortly after the website went live, the entire 2nd floor of the building was leased.